I was in Singapore for the weekend, to catch Megadeth and Heaven And Hell. But that’s not what this blog entry is about! I stayed off Clarke Quay, a 5 minute walk from the camera geek hub of Singapore – Funan IT Mall, Peninsula Plaza and Peninsula Shopping Centre. These three places also had guitars, while Funan had computer equipment… very much like Bintang Walk, the geek hub of Kuala Lumpur. Look mommy, the first ever digital SLR – it was a Kodak! 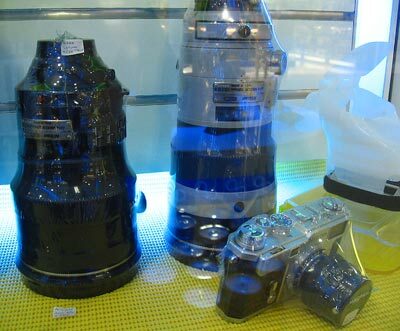 Singapore was indeed heaven for people afflicted with Gear Acquisition Syndrome; all sorts of weird, rare lenses and cameras were available. Loads of old Sigma lenses, in all mounts – Nikon F, Contax/Yashica, Olympus OM (yes, manual focus), Minolta MD (yes, manual focus), Pentax K, and Minolta AF. Loads of old Minolta 28-80mm F3.5-5.6 kit lenses (both in silver and black). 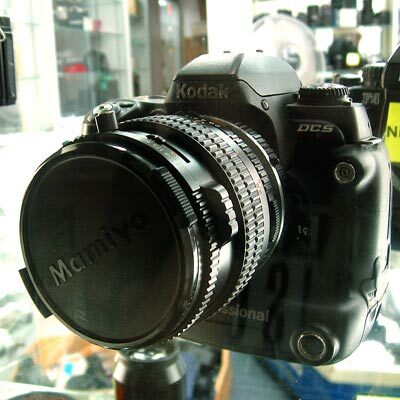 P&G Photographic Centre in The Adelphi had the Vivitar Series 1 Q-Dos for Minolta MD mount, for SGD320! 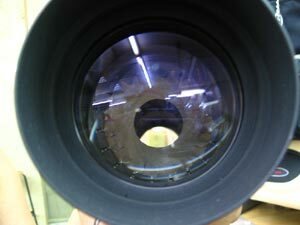 This rare lens had a switch that would add a red and blue filter to make stereoscopic images! They also had loads of M42 lenses, ironically all 28mm F2.8 lenses. I have never felt so much love for my Minolta X300. Loads of old Minolta MD mount lenses. (Back has 50mm F1.4 and 135mm F2.8 lenses, a weird 35-70mm F3.5, 35mm F2.8, 28mm F3.5, and the original push-pull design of the Leica-collaborated Minolta 70-210mm F4 MD, which later became the beloved autofocusing Minolta 70-210mm F4 beercan lens. 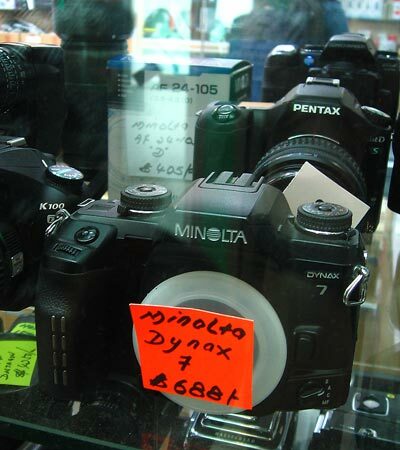 The Camera Workshop in Peninsula Shopping Centre had a new Konica Minolta 7 Digital for SGD1650! 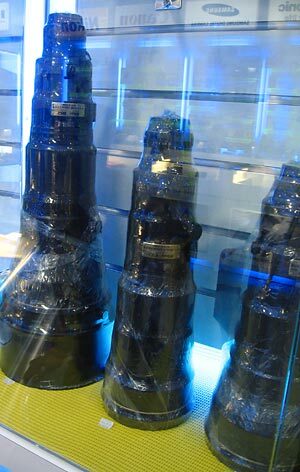 They also had the great Minolta 24-105mm F3.5-4.5 for SGD405, the original companion to the Dynax 7 film SLR, also sold there! Sweet mother of god, the Minolta Dynax 9 professional film body. 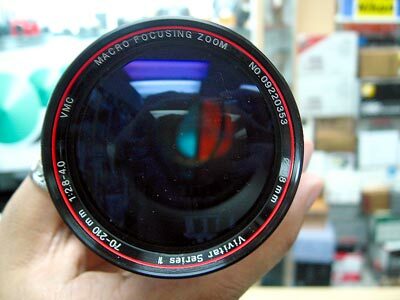 Guess what lens this is! …a Pentacon 300mm F4, with M42 mount! The Tamron 200-400mm F5.6 wasn’t hard to come by, either, at SGD820, in different mounts; Cathay Photo, Peninsula Plaza, stocked Teleplus 2x MC4 and MC7 teleconverters for all AF mounts. In Malaysia, we can only find the Canon and Nikon mount ones! These were a cheap SGD150. Cathay also had the Sony A700 (one of the few who had it) and the Portrait Grip for 449 SGD. Lensbabies in all generations and mounts were there, with the LB 2.0 going for SGD255. 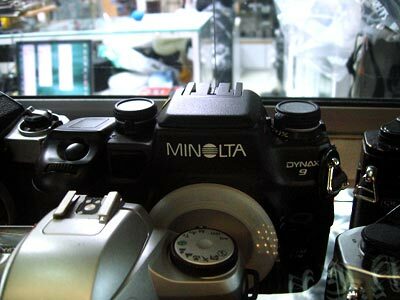 Prime Camera Center had a mint Minolta Dynax 9, a professional film SLR, for SGD1800! K13 in Peninsula Plaza had the unheard of brother to the well-loved Minolta 70-210mm F4 beercan; the auto-focus Minolta 70-210mm F3.5-4.5, for SGD280! 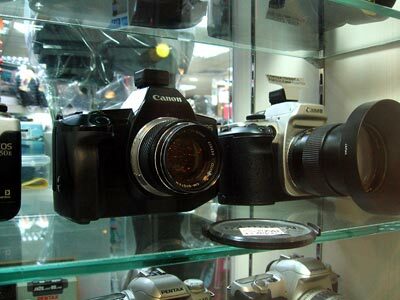 They also stocked converters to Canon EOS mount, in the key of Yashica/Contax, Olympus OM, Nikon, Leitz and Carl Zeiss. Quite like what FourThirds is doing, too. However, the one thing that made me wish I had a credit card right there was Alex Photo, Peninsula Plaza, which had a Canon FD 58mm F1.2 for SGD300 and a Minolta Rokkor 58mm F1.2 for SGD400! I headed down to Orchard Road, and got lucky in Lucky Plaza. Photo Graphic & Video Mania had the Sigma 24-70mm F2.8 for A-mount for SGD735. APO Foto had the Sony 70-200mm F2.8G SSM for SGD3450! The Sigma 24mm F1.8 for A-mount was also interesting at SGD560, while they also stocked the (reboxed) Vivitar Series 1 70-210mm F2.8-4 for SGD355. Oh, and the Dynax 9 in a box. For SGD2300! Back to Funan IT Mall, Alan Photo had the goodies, like the Canon 200mm F1.8L USM (that rare-earth one, replaced with a dimmer 200mm F2L IS), the big ol’ Nikkor primes (200mm F2, 300mm F2.8, 400mm F2.8, 500mm F4, 600mm F4). Yes, that’s a white AF-S Nikkor 300mm F2.8D next to the AF-S Nikkor 200mm F2 VR, the only VR lens brighter than F2.8. 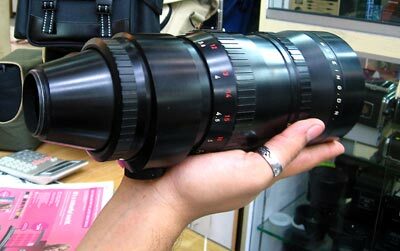 All the other big Nikkors became redundant when Canon rolled out IS versions of all these big telephoto lenses. This entry was posted in Geek, Pictures on October 30, 2007 by 2konbla. macdude: Yeah maaan. Wish I had a credit card. Then again, thank goodness I don’t. Canon Freak: Were they upstairs or downstairs? I remember a row of camera shops near Alan Photo. Wow looks like singapore a good place to shop for camera. Maybe I should try shop there. Compared to Singapore and Malaysia which do u think more beneficial to get camera and their gadgets albert? ShaolinTiger: Yes indeed! What more if you can afford to buy lenses in 5 different mounts! Almost everything becomes viable. Oh man. Any pics from the concerts? Dio with Black Sabbath rocks my world like hot roti canai with good curry rocks my breakfast. zaque: If you work there, you earn more so cameras feel 2.3x cheaper. Otherwise, cameras are the same price, but you get a LOT more variety than Malaysia, who only really fully stocks the big brands. I love Peninsular plaza, it’s like heaven. Really bad for people with GAS tho. aiman: Yes, where stated it is a film SLR, it is. The Dynax 7 and 9 are both film.